The Amazon Kindle Fire HD tablet line is expected to be updated this year in order to take on the new Nexus 7, and it looks like we're getting our first look at the smaller of two slates. 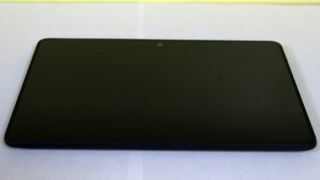 The Kindle Fire HD 2 is said to be pictured in seven less-than-clear photos obtained by BGR, one showing off the normal-looking front of the 7-inch tablet and the rest focusing on its unique backside. The face of the tablet has a front camera and what looks to be plenty of bezel, something the first-generation Kindle Fire HD and even the Google Nexus 7 have in common. The more interesting rear of the alleged Kindle Fire HD takes on an angular design that remains flat in the center and then dramatically slopes near the sides of the tablet. It looks like an old-fashioned projection television. Maybe the LG G2 smartphone with its back volume buttons has started a trend. BGR mentioned that portions of Amazon's Kindle Fire HD tablet have been covered up in the photos to mask identifiable marks, so we certainly don't have the full picture. The 7-inch Kindle Fire HD specs are rumored to include a 1920 x 1200 resolution screen, a Qualcomm Snapdragon 800 processor and 2GB of RAM. That would certainly be an improvement over last year's 1280 x 800 screen resolution and 1GB of memory. This is just the smaller 7-inch version, as Amazon is reported to have a Kindle Fire HD 8.9-inch in the pipeline with the same angular design but bumped up specs. However, the launch of the two Kindle Fire HD 2013 tablets may be staggered. That was the case last year when the 7-inch model came out in September and Amazon held off on releasing its 8.9-inch tablet until mid-November. That just leaves time for more leaks of the MIA 8.9-inch Kindle Fire HD in the weeks head. See video of the alleged iPad 5, a prime competitor for the Kindle Fire HD with less bezel.